Hundreds of artists banged clogs together on Shagaret El-Dor Street in front of Egypt’s culture ministry in Cairo, a reference to 13th-century Egyptian ruler Shagaret El-Dor, who was beaten to death by slaves using wooden clogs. The crowd of a few dozen gathered around 3pm, and by 4pm the numbers had grown to several thousand. 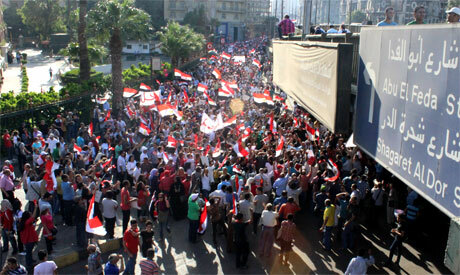 Artists from all fields and generations formed a large march that headed through Zamalek towards Tahrir Square. The artists were joined by many passers-by. The chants started filling the Zamalek district. “Leave, leave,” protesters chanted. “We will not leave; he has to leave,” in reference to President Mohamed Morsi and the Muslim Brotherhood. “Raise your voice; we don’t want the revolution to die,” artists chanted, inviting people from nearby buildings to join the march. Most chants focused on the importance of the arts and culture, the role of artists as opposition voices, and the close ties between the people and the army. While chanting, artists held red cards expressing their dissent with Morsi’s government. The wooden clogs were used to create a rhythmic sound that echoed across the entire neighbourhood. Some elderly people walking with canes also showed up at certain stages of the march. Among the protesters in front of the ministry was a woman in a neqab (black Islamic dress covering body and face). “I came to support the call to remove Morsi. I love the arts; it’s the most beautiful thing we have. Artists must to continue… they are great people,” she told Ahram Online. Among the demonstrators are actors Khaled El-Sawy, Mahmoud Kabeel, Lobna Abdel-Aziz, Hany Salama, Abdel-Rahman Abou-Zahra, Olfat Amr, Maha Abu Ouf, Aida Fahmi, Ahmed Bedeer; writer Mohamed El-Ghitani, film directors Khaled Youssef and Amr Abdel Aziz, pianist Mohamed Saleh, conductor and composer Hisham Gabr, harpist from the Cairo Opera Orchestra Manal Mohie El-Din, head of the Academy of Arts Sameh Mahran, former head of the Cairo Opera House Ines Abdel Dayem, Grammy award-winning sound engineer Alaa El-Kashef, pianist and arts manager Ahmed Abou-Zahra, violinist Osman El-Mahdy, principal dancer from the Cairo Opera Ballet Company Hani Hassan, and renowned theatre critic and academic Nehad Selaiha, among hundreds of others. As artists marched through 26 July Street, the numbers grew to a couple of thousand. When by 6pm the march reached Tahrir Square, the Qasr El-Nil Bridge leading to the square was filled with protesters. Marchers found it difficult to enter the square, which was already filled to capacity. The event was the largest march organised by artists since Egypt’s January 2011 revolution. Artists’ and intellectuals’ determination to remove President Mohamed Morsi and the Muslim Brotherhood from power is supported by nationwide protests by Egyptians from all walks of life.